In traditional Ring Toss (aka Quoits) the goal is to land the most rings, or maybe ANY rings. Maybe you win a prize, maybe you get the thing you ringed, or? In Beer Pong the idea is to land your ping pong ball(s) in the other side’s full cups and THEY must remove and drink them down. There are legions of variations of each game, often augmented by House Rules which make the basics more fun, more challenging, and often more adaptable to the players’ ages and skills. In Toss It Off the idea is to fill the 16 lovely and unique ceramic sipper cups with something delicious (A serious adult beverage? Jellybeans? Money? Priveledges? ), arrange them within the playing field’s bigger box and begin tossing. A ring around a cup means that player gets the cup’s contents, removes it and its little carrier box from the playing field and then rearranges the remaining cups for the next player to aim at. It’s customized House Rules that determine the number of players/teams, the tossing distances, the number of rings per play, what to do about “leaners” and all the rest. Fusion games open up more opportunities for interpretation and I certainly want to foster that! Surprisingly, the hardest part for me in completing this game was finding the right tossing rings. Certainly ceramic rings would be wrong (d’oh), but throughout the design and making, I had just planned to crochet rings from fun mohair yarns. It turns out yarn rings are too floppy, too light, too shaggy, or too homely. I added thin wire to the yarn rings which created better heft and flight, but was still an artistic distraction. Tried the thin colored wire by itself, plain and crocheted (Yes, I crochet fine wire.) Too springy. Found subtly-colored thick wool felt which looked good next to the textured ceramic cups, but in order to fly their best, the rings had to be too wide and tended to land on top of the cups instead of around them. I looked online for ring toss rings and haunted the local toy stores. Plastic? Too garish. Rope rings? Not small enough and the wooden bead attachment was deadly. Leather? Silicone? Never found any and time was running out. I was more than a tad desperate when my brother suggested rubber O-rings and it turns out there’s a local industrial store that carries all kinds. I gave the guys there a thrill when I brought in one of the cups and tried some O-ring sizes out, saying that I wanted them for a drinking game. They promptly invited themselves to be testers. I blew my allowance on two packs and dang if they don’t play well, fit in aesthetically and increase the fun. 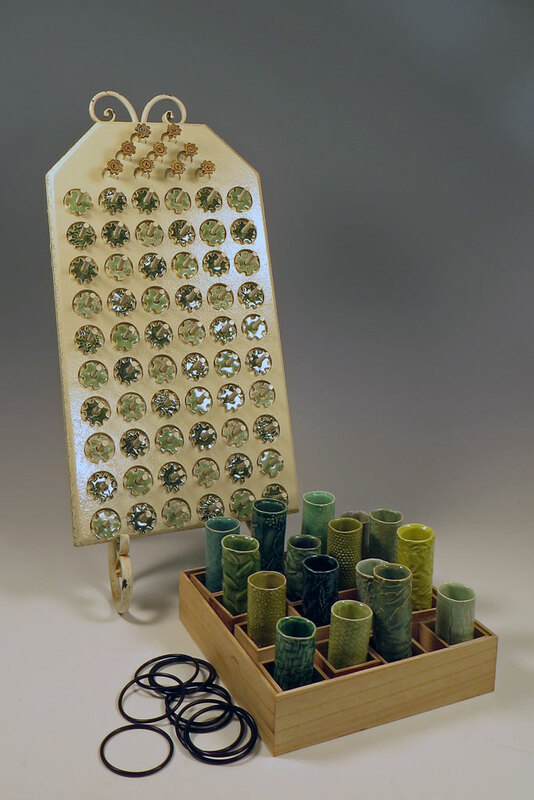 The found object 1970s spool and bobbin holder was so suggestive, its 6 x 10 array of pegs just asking to be a game board. But for what kind of game? I bought two colors of small metal washers and tried out a bunch of candidates. Territory was captured, long lines were made, extra powers gained by doubling up or reaching the corners, yet nothing really clicked. When I checked out the Connect 4 family and a five-in-a-row game called Gomoku, I was onto it. The one catch was that both games played like TicTacToe in that unless the first player blew it somehow, they would win every time. Deterministic, unfair and boring! A simple adjustment, however, fixed that one: The first player plays ONE gear, but for all subsequent moves, each player plays TWO gears. Just that one change takes these games into serious adult strategy territory, thereby creating a gameplay choice for different ages and abilities. Connect5: Start with an empty board and play on the pegs starting at the bottom, building vertically, attempting to obtain a Gear Train of five in a row in any direction, including diagonally. Can be adapted to any number in a row players want up, to six (the board’s width) and of course be played in its simpler, one gear at a time version. Gomoku: Start with an empty board and play anywhere on it, attempting to be the first to obtain a Gear Train of five in a row in any direction, including diagonally. The small removable gold gears at the top of the board spell out GEARTRAIN in a pyramid – and from there the letters anagram into nearly 350 combinations. The tiny spent 22 shells that those small gold anagramming gears are mounted on. The handmade marbled paper on the back of the board and on the Gearbox used to hold unplayed gears. That impossibly sweet vintage easel. –Liz Crain, who seriously needs to play a drinking game right about now. March 2 – 31, 2018, Roscoe Ceramic Gallery, 473 25th St. Suite 5, Oakland, CA, 94512. 415-515-3174. Reception: Oakland First Fridays, March 2 from 6-9. I will be there to play games with you! Oh Liz, I love your fun and imaginative games. Wish I was there to play. Have an awesome show! Would love to see your smiling face in person! Thank you. That would be so fun. Let’s go a bit south of here and enjoy the view while we do!